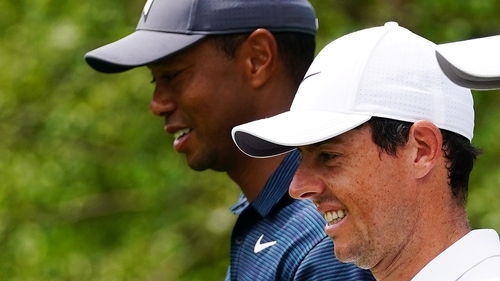 Rory McIlroy is keen to see how Tiger Woods handles the hostile crowd reaction he’s likely to get when he’s playing at the Ryder Cup in France later this month. Woods is normally a major fan favourite, with supporters following the group he’s in and cheering on the 14-time Major winner. But the roles will be reversed at Le Golf National in Paris between 28 and 30 September when the large and partisan European crowd will be shouting against him. "Especially with us being at home, he's playing against the crowd where it's usually the other way around," said McIlroy, who is expected to be one of the home team’s main scorers in the competition. "I think it's not very often that the crowd is against him and this will be a very rare occasion in France. "There probably will still be some people cheering for him but, for the most part, they'll be cheering for the European team." McIlroy also believes that it will be different for whoever is facing Woods, a wildcard pick for USA captain Jim Furyk, on the European team. The American’s playing partners in regular tournaments are often considered a sideshow to what the supporters have come to see, but on this occasion they will be very much centre stage. The County Down golfer is currently in America at the BMW Championship, the third tournament in the season-ending FedEx Cup, which features the top 70 players in the standings. The top 30 this weekend will qualify for the finale at the Tour Championship. There was controversy during the week when Europe captain Thomas Bjorn selected Sergio Garcia amongst his Ryder Cup wildcard picks. Paul Casey, Ian Poulter and Henrik Stenson were the others. It was Garcia that generated the headlines though given his recent slump in form and string of missed cuts. McIlroy isn’t getting het up about it and is backing the captain’s pick, saying: "I feel with the five rookies we have, experience will be a big thing. "Paul, Ian and Henrik, they were certain and then it was between, I guess, Sergio, Rafa (Cabrera Bello), maybe Matt Fitzpatrick, a couple of those guys. "But at the end I think with Sergio's record in the Ryder Cup, and I think the intangibles as well, the things people don't see what he does in the team room. "He's made my experiences at Ryder Cups better. He's been a great partner for me. He's been great in the team room. "It's just stuff that you don't see. Obviously his record speaks for itself but it's stuff people don't see is basically what got him this wild card pick you know."